AHEALTH » How Can Bleeding Possibly Be Beneficial? How Can Bleeding Possibly Be Beneficial? The following is an article from Dr Rizwhan Suleman (Mchiro) of Hijama Centres UK. Cupping is the modern term for an ancient medical treatment in which a partial vacuum is created in cups that are positioned onto the surface of the body. The vacuum created by either heat or suction draws up skin, subcutaneous tissue and muscle layers a few millimeters into the cups. Hijama or wet cupping is also an ancient medical technique popular amongst Arab cultures. It utilizes the same principles of regular cupping therapy except it allows the release and removal of stagnant blood, toxins, inflammation and swellings through the application of small scratches or pin pricks over the areas where the suction is applied. This combination of cupping therapy and controlled bloodletting has been utilized for over 3000 years and was a practice the prophet Muhammad (pbuh) promoted & recommended as an inspiration from God. The practice of wet cupping was also an integral part of more recent medical practice as it developed in the Middle East and was used up until the 1800’s even here in the UK. Although a simplified explanation wet cupping can be likened to a mechanical form of leaching allowing small quantities of blood to be released from swollen and painful areas of the body, to give relief, promote healing and to regain function. Many conditions that we suffer with are related to inflammation. This includes all conditions that end with the word “itis” such as arthritis, tendonitis, gastritis, appendicitis etc. The common factor in all these conditions is that there is too much unwanted inflammation in that area. This is why anti-inflammatory medication is regularly prescribed to try and reduce down the amount of this inflammation. Unwanted inflammation can be simplified as a state in which there is too much blood in an area causing pressure and stagnation preventing the regular flow of nutrient and waste exchange, resulting in pain and compromised natural healing abilities. If left untreated this can develop into a chronic state in which the reduced blood flow allows the build up of waste, carbon dioxide and acidity, causing further pressure, cell damage, pain, and discomfort leading to more inflammation, perpetuating the problem. Chemical drugs can be used to reduce pain and dampen inflammation but cupping therapy has the unique ability of drawing out inflammation, stagnant blood, cell debris and toxins from deep within the body to the surface of the skin. By utilizing wet cupping this built up pressure can be released through tiny pin pricks or light scratches on the skin which often gives instantaneous relief and allows fresh blood, nutrients and oxygen to penetrate the area breaking the cycle of pain and discomfort. Traditionally it has been understood that wet cupping also allows a process of purifying the blood and removing unwanted materials from the system. By removing these elements you can reduce the problems that they cause and reduce pain, discomfort and inevitably disease. For this reason wet cupping therapy has been used throughout history to treat a wide range of conditions and even as a preventative medicine. The Prophet (saw) used hijama as a method of detoxification; after ingesting poison, treating hip pain, as a treatment against black magic, for his ankle after twisting it and he would also recommend it to people with Migraine. He (saw) would also use it regularly without having any problems, as a preventative medicine. Throughout history hijama has been used to purify the blood & for a wide range of conditions ranging from infertility & skin problems to gout & arthritis. When practiced in a clean & hygienic environment under the guidance of a qualified Health Professional hijama is very safe & relatively risk free. Unlike other forms of medicinal interventions hijama does not bring anything foreign into the body eliminating the chances of having a “reaction” to the treatment. It simply acts by restoring your body’s ability to repair and function to its optimal level. Practitioners can screen for various problems & complications before performing the treatment. This involves checking blood pressure, medication & previous medical history, allowing referal of complicated cases to a senior physician when indicated. Although the quantity of blood removed in hijama is relatively minimal, iron levels and anaemia are always taken into consideration. Materials used to perform the treatment are all single use & disposed of after each patient. 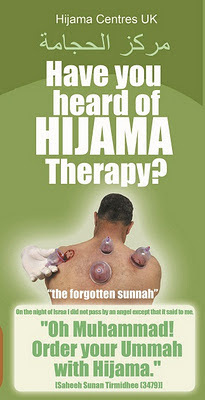 When can hijama be performed? the consensus of the scholars that like any medicinal treatment hijama should be used as & when needed. This is how the Prophet (saw) used it when treating health problems. There are ahadith that mention a preferred time of the month (17th, 19th & 21st) however the prophet (saw) also performed it out of this time such as while on Hajj. There are no dates, times or days when hijama is not permitted. We are a group of Qualified Health Professionals & experienced hijama therapists that provide hijama in an increasing number of clinics throughout the UK. We have years of experience in practicing hijama & provide care for our patients under the guidance of Qualified Health Professionals and Doctors. We are all passionate about promoting natural health through the guidance of the Quran & Sunnah. Our aim is to revive this forgotten Sunnah & make it a means of bettering the health of the Ummah. Our thanks to Hijama Centres UK, from UK for sharing the above post. If you have any questions or want to leave some feedback for them, then please do so via a comment* below. really appreciate. Allah bless you! Very interesting & Scientific article bro. To know the traditional aspect of hijama it is essential to know about unani medicine. Unani medicine is also known as Traditional islamic medicine. According to unani Concepts the fourth humour i.e Sauda or black bile which is saturated with toxins is removed by Hijama procedure.